Registering a domain name is the initial step in getting your business online. The domain name is a unique identity on the internet and allows people to find you fast and easily. There are many aspects to take into account when selecting a 'good' domain name. Firstly, it must be applicable for yourself or your business. If domain name is not matching your business name or product/services you are offering as potential, visitors will have a hard time to search or remember it. The character length or word count of the name can also be a factor in a visitor memorizing it and therefore returning to the website. The domain name itself can also be a factor in the increasingly important SEO (the process of tweaking the content and layout of a website in order for it to rank high in major search engines to get quality traffic to your website). If your business name contains keywords about your business then this is ideal. However, if your selected name does not give any clue to the products or services offered then it is often a good idea to contain an additional word in the domain name. Via GoingIT's web server, you get faster response. Faster responsive DNS server managed by us. Our DNS server response time is less than 30ms. If you have a domain with another provider, transferring your existing domain name is easy with GoingIT. 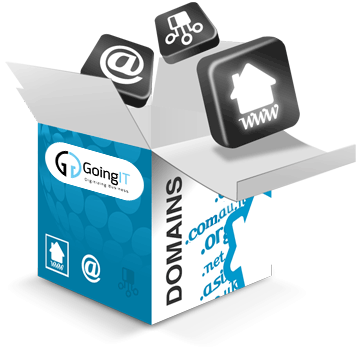 Domain management is easy with GoingIT's features. You'll be able to make speedy, straightforward changes with our advanced control panel. Simply fill out the online application form with your website address. Then select "transfer an existing domain name". If you need help along the way, Contact us on 1800 13 1300 and we will help you throughout the process. We know one size doesn't fit all and that is why we have a varied range of SEO plans to suit every budget. Result driven and customised SEO services and strategies from GoingIT team can impart a lasting effect on your website traffic.